Buying a new Austin 10hp car in 1946. Homepage. This page: A receipt for a deposit put down on a new Austin Ten saloon car by a RAF Officer in 1946. A new Austin purchased in 1946. The receipt displayed below refers to a new Austin 10 saloon due to be purchased by a serving RAF Officer in 1946. Other paperwork that came with this invoice confirms that during the war Mr C.A. Butler had been a Squadron Leader based at RAF Pitreavie Castle in Dunfermline, following on from a posting at RAF Leuchars. Coastal Command operations took place at the Pitrievie Castle site during and after the war, with extensive undergound facilities remaining in place until the facility's final closure in 1996. This new Austin 10 Deluxe, for which the deposit of £25 was paid on May 24th 1946, replaced an earlier chrome-rad Austin 10 of 1934, a car that had been laid up during the war, and had only recently been extensively serviced (described here). 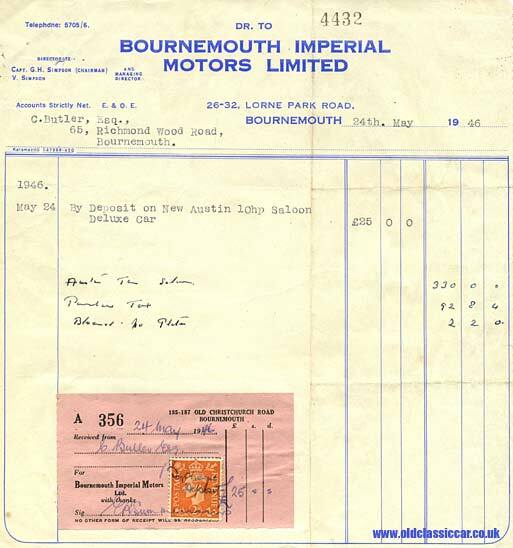 An invoice for work done to the earlier 10hp Austin by Central Motors Ltd in 1938 can be seen here.The post-war 10 was a much more modern looking car, featuring a curvier bodyshell, and a rear-hinged, "alligator" style one-piece bonnet. A photo of a virtually-identical Austin 8 from 1946, seen at a show in Wales a few years back, can be found on this page. The basic price for the new Austin 10 was £330.0s.0d, to which £92.8s.4d Purchase Tax had to be added, and a further £2.2s.0d for Bluemels number plates. As for Bournemouth Imperial Motors Limited, there are few online references. It appears to have been a main agent for Austin cars for some time, as I did find mention of a Mini Cooper sold from this dealership during the 1960's. The receipt lists a Captain G.H. Simpson as Chairman of the firm. Born in 1888, Gerald Hemploe Simpson served with, amongst others, the Royal Engineers during the Great War, and entered the motor trade with Bournemouth Imperial Motors shortly after the Armistice. The dealership's address in 1946 is given as 26-32 Lorne Park Road, Bournemouth. A check in the back pages of AUSTIN magazine in March 1964, lists this firm, but at a different address - Norwich Avenue, The Triangle, so perhaps the business re-located entirely, or the head office operations moved over to this new location? A check of a 1967 copy of the same publication no longer lists the firm at all under their list of authorised Austin spares depots. More items of paperwork, such as booklets, leaflets and similar motor-related ephemera, can be found in the Motoring Collectables section.